﻿ Shanghai uni-charm Co., Ltd.
Shanghai Yueyueshu Women Products Co., Ltd was founded in 1995, after the garden -- Shanghai Sheshan national tourist resort is located in the international metropolis, the factory covers an area of 45000 square meters, fresh air, pleasant environment, convenient transportation. 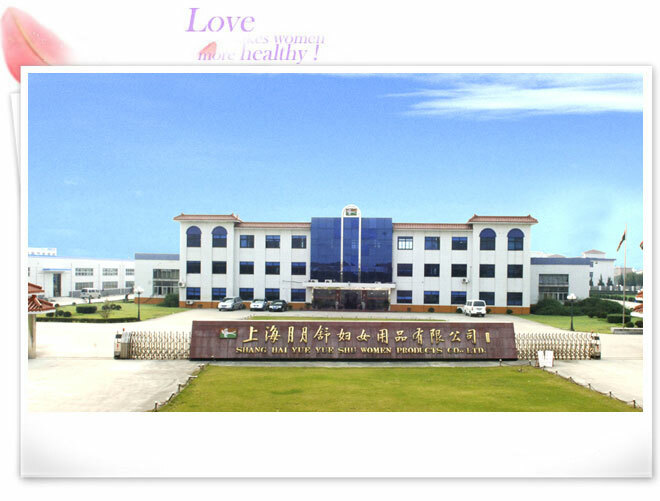 The company is based in Henan Wan Xi pharmaceutical group this solid pillar of the economy as the main body of investment, to national each big medical, health departments of scientific research, technology support, at present, the main production and operation of "Shu" brand of feminine hygiene products and "Huazhi" brand of household paper, devoted to women's health of the modern enterprise. "Shu" feminine hygiene products, is the country medicine famous "Shu" Tongjingbao granule sister product, product design, raw materials, the pursuit of scientific and reasonable select import, strict production quality, the quality monitoring system of advanced, with lean for fine each day, each piece is customer satisfaction production target, ensure to provide consumers with safe, assured of health products. In 2002 the company passed the ISO9001 international quality management system certification, to provide the conditions for the company quality management more scientific and strict. Will be adhering to the "care for the lives of women, protecting women's health" purposes, to provide a more healthy, more confident, more comfortable, more wonderful life for women. Mission to revive the national enterprises, to meet customer demand as the guide, the constant pursuit of scientific management, accelerate product upgrading, and strive to establish a Chinese famous brand!